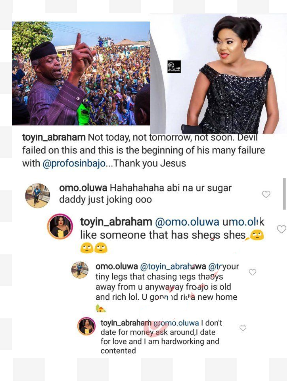 Nollywood actress Toyin Abraham has finally opened up on dating Yemi Osinbajo, saying money is not her driving force when going into a relationship. She made this known while putting a fan in her place earlier today on Instagram. fan had asked if she was dating the rich Vice President. Toyin had quickly retorted that she is a hardworking woman who is contented with her own wealth.